The claim that 2015 was the hottest year since 1880 is based on only one of the five recognised global temperature records (GISS/NASA). You can’t even get your opening statement right, can you Bryan? 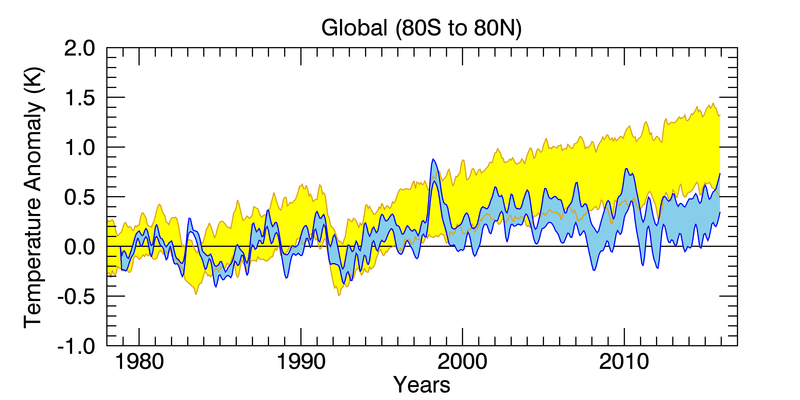 2015 was the hottest year according to GISS, NOAA, Hadley Centre, Berkeley Earth, JAMA etc etc. Because these are indirect, large-scale estimates of temperature well above ground level, derived from satellite data, they need not correspond to trends in direct ground-based measurements of surface temperature. And for the record, pointing out that you are egregiously wrong is not ad hominem. Reminding people that you folded a trust to avoid paying a $90,000 court-ordered judgement against the Climate Science Education Trust, or that you’ve been a Heartland-sponsored mouthpiece for climate denial propaganda for at least a decade, are simple statements of fact. Watching you desperately attempt to spin the hottest year into something else, however, is at least mildly entertaining. … and a tragic one for the local people who loose everything they had. Bob, can you check that link in your own blog post to the original article? Its not working. You should take the “m.” away. since most people are perhaps not using mobile phones for browsing. Another bit of news is the Nature Climate Change article “Industrial-era global ocean heat uptake doubles in recent decades” by Glecker et.al. Their finding is that 50% of the heat stored in the global ocean since the industrial age began went in since 1997. Scientific American published an article about the paper, i.e. “Deep Ocean Waters Are Trapping Vast Stores of Heat”. There appears to be a significant delay before el ninos really show up in the satellite data. There are various articles on this in the media. For example the big el nino of 1997 – 1998 doesn’t really show up in the satellite data until mid 1998. So last years el nino may not show up fully in the satellite data until this year. Have a look at the graph in the link below. I dont know why this would be so, but maybe heat released from the oceans affects the middle atmosphere more slowly? Their most cited graphs show a thin black line for their “measurements” with zero error! While showing a wide yellow band for climate simulations. The truth is: the RSS measurements rely on a very complex model that converts radiation signals arriving at the chips of their satelites somehow into a “temperature” reading. The actual error bands in their models surely are significant. So why are they not shown to the public on their most cited data page? 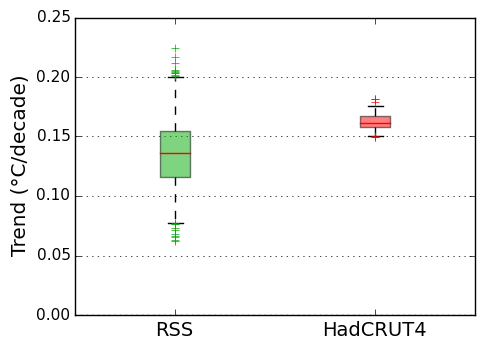 RSS uncertainty is about 5 x that of HadCRUT4 ! Yet the RSS temp line is shown with a thin black line in their graphs, inviting people such as Curz, Monckton and others to abuse them to their ends. The satellite measurements of the atmosphere, whether UAH or RSS, just may not be reliable. The following article is interesting. Anyway, we live down on the surface. Carl Mears has been actively pointing out that the surface tempo record is more accurate than his satellite data. See Climate Crocks for a video. Yes his analysis in his papers is great. Its that their home page graphs are not ideal and have been abused by the denial maschine. An early literary citing of “shooting the messenger” is in Plutarch’s Lives states: “The first messenger, that gave notice of Lucullus’ coming was so far from pleasing Tigranes that, he had his head cut off for his pains; and no man dared to bring further information. However, it probably escaped you that RSS is a private research organization and Mad Donald can’t fire Mears. If RSS doesn’t add any value then why don’t they scrap the project? Of course it adds value. It’s useful to know how the atmosphere is warming at all sorts of levels, even if it’s not a measure of the temperature where we live. RSS is also useful as way of keeping the UAH guys honest. Are you claiming that satellite models are “garbage in garbage out”? It would appear so given your choice of acronym. Perhaps we can also ignore the satellite measurements of sea levels while we are at it. Satellite data is used by conservatives to discredit surface temp records. Satellites don’t measure surface temperatures. They infer lower troposphere temperatures from radiance levels. Surface and lower troposphere temperatures are correlated but they are not the same thing. This seems to be forgotten by those who claim that RSS and UAH ‘is the best data that we have got’. Surface and lower troposphere temperatures are correlated but they are not the same thing. It would appear that they are not that well correlated. In the short term, surface and satellite correlate very well, but in the long term they definitely drift apart, as Tamino discusses here. Is that a function of instrument/orbit drift, or of changes in the atmosphere that affect the model used to extract the temperatures from the radiance data? Anyone’s guess at the moment, but Eli has some ideas. andy, all models are GIGO, which is why it’s so hilarious when pseudo-skeptics like yourself say things like that. There’s nothing special about GCMs that make them more GIGO than any other type of model. If the recent drift in satellite temperature does turn out to be because of instrument drift, that would be a perfect example of the GIGO principle, in fact. But of course, we won’t be hearing about that from the likes of WUWT or Delingpole, will we? A GCM is quite a different kind of model to the algorithm used to process satellite data, I would suggest. A GCM tries to extrapolate from an initial condition into the future, and model drift is quite likely because we cannot recalibrate the model at times in the future. The term GIGO is a colloquial term to suggest that if the input is garbage, then the output will be garbage. This isn’t always true, but the term “garbage” isn’t well defined here. I would assume that inputs to satellite algorithms are not “garbage”. Neither are inputs to surface station data. Even a temperature station next to an air conditioner or runway is not garbage if it is possible to filter out the extraneous signal, though obviously it would compromise the result if the signal to noise ratio was low. But spouts on and on anyway. Not knowing what he is talking about has never stopped him in the past. Typical behaviour from our resident troll. We all know Andy that seeing things for what they are is difficult for you. You have left anybody here without any doubt whatsoever. If you could see, then you would be able to read about instrument drift of the satellite data and the discussion of the same on the websites you could find if you could see what happens when you type something into google…. AIGO: Anything in Garbage out. No matter what you see or read or hear, you convert it into G.
Oh, and to add: The fact that all models are GIGO does not mean that models are wrong or that their output should be disregarded. See, unlike an AIGO machine like yoursel, GIGO models and processes can produce reliable and valuable output when fed with reliable input. Before you start complaining about the author and CFact, it is written in a very non-partisan and objective style, though there is no mention of instrumental drift. Trust andyS to choose an article full of lies and misinformation. I wouldn’t be surprised if he doesn’t even know what radiosonde is, probably thinks it is punk music on his little transistor radio. See, there’s your problem. Don’t assume anything. It is becoming apparent that something in the inputs to the satellite algorithms has changed – either drift or ageing in the instruments themselves, or else something about the atmosphere that is changing in response to the temperature change. When the inputs change, but the algorithms don’t change to compensate, then the output will not make sense. That’s the whole point of GIGO – if you feed a model data that differs from what it expects, you can’t trust the output. Which is why it is ridiculous to claim, as some do, that the satellites are the “best” temperature record. Denialists also claim the surface data is “adjusted” completely ignoring the fact the satellite data is adjusted. Denialists just throw a lot of contradictory mud around hoping some will stick. Unfortunately some does. Skepticalscience.com are saying this years temperatures will likely set another massive record, and by another significant margin. They are saying we have barely begun to feel the full affects of the el nino in the surface temperature record, as well as the satellite record. This would suggest global warming may be changing the nature of el nino. I don’t see these big spikes in the early 20th century. The new graphs show the date range to 2015 and also show the Satellite data uncertainty bands. You may need to clear your browser cache before the new site content replaces the old. Perhaps the denier crowd won’t be fooled by the data that easily any more now. With the glaciers melting, we also loose a significant record of the Earth’s climatic past. Ha! Thanks Thomas. I was just reading that glacier article last night, in the paper edition. I bought it mainly for the inner self article, but got around to the climate article last night. The rates of melting is astonishing. This illustrates one of the things with the whole climate issue : There’s a lot happening around the world which many people are probably not aware of, and so its easy for sceptics to pull the wool over peoples eyes and play down the issue. I don’t keep up with it all by a long way, but being semi retired I do a little better than the average person. National Geographic November 2015 paper edition have a great article on climate change. Some of it may be on the internet. Basically the whole magazine is devoted to it. It has some good material on the arctic and greenland in terms of ice loss, and impact on natural habitats and the people who live up there. Again, the rates of change are all quite astonishing. Yes indeed. And it is infuriating really how utterly incomprehensible the reaction of the right wing – so called conservatives…. what do they really strive to conserve, certainly not the planet we depend on? – is, especially in the USA. The evidence for rapid warming of the planet is written all over the indicators of nature and we know very well what is causing it and what is certainly not. How can it be, that in a nation that produced the NASA space programme and is host to some of the very best universities in the word, so many people still chose to believe in utter nonsense and conspiracy theories while denying the evidence that science laid dutifully at their feet for decades? What is the chance that humanity will survive the next few generations if these Republican loggerheads and dullards are permitted to carry such weight in a nation that wants to be the leader of the ‘civilised’ world at such a critical time in our history? I broadly agree there Thomas. I have wondered about the same things, and I have read a couple of articles on the issue. Why are American conservatives such big climate change sceptics? I think maybe it’s because conservatives don’t like change, and prefer to hold onto traditions. That’s basically the dictionary definition of conservatism. Conservatives probably don’t like the fact that climate is changing, and that this may also force changed lifestyles. I think its that simple, Occams Razor. As a result conservatives go into denial about the science. I’m not saying conservatism is a bad thing. Obviously conservatism and liberalism both have merits, but American conservatives seem very deeply conservative, and it is also deeply tied to religion. This may be enough to explain the higher than average climate scepticism in America. As you say its baffling how they can embrace putting a man on the moon, and yet be in such denial of certain other sciences. But this is the result of trying to embrace technology and scence while trying to hang onto traditions and religious views about creationism. It produces some strange outcomes. Conservatives also tend to be suspicious of big government, or activist government for some reason, possibly again out of fear of change being forced on them. However as a result they may be suspicious of quasi government bodies like the IPPC or legislative responses to climate change. This suspicion is not inherently bad, for obvious reasons. “But” it becomes a bad thing when it becomes irrational in the face of rather strong evidence that we are causing climate change. However putting conservative views aside, there may be other factors in climate change scepticism. There seems to be quite a list of possible ideological, psychological and vested interest factors I’m sure you are aware of. One factor that bears special consideration is how our minds process information. Recent science is suggesting our minds are not constructed to deal well with long term problems, and respond best to short term threats, understandably enough. However this makes it hard for some people to grapple with climate change, and envisage the future. This is a big stumbling block, and it requires some sort of circuit breaker to jolt humanity into seeing the future better. Humans are driven to spread the genes of the species, but this will be more difficult in an unstable climate! Completely agree. It is a mix of various aspects that come together in creating angry righteous men who take no advice from anybody unless they apriori agree to it already and unless it gives them a permission to vent their anger at some enemy of sorts, mostly “aliens” in the American way of labeling those others…. However, human-caused climate change is caused by all of us. It lacks the “aliens are responsible” factor entirely which explains a lot of the psychology of the right wing American underbelly…. It is because they have a written constitution that supports the rights of individuals over the government. What Andy S, has this to do with the denial of reality by large parts of the right wing of the USA? Some American conservatives believe that the right to bear arms exists to act as a deterrent against the Government interfering in their lives. Andy probably likes the idea. The constitution only enshrines certain specific rights, however there is is no amendment to the constitution that lets people pollute or alter the climate. Yet Conservatives seem to believe the constitution somehow gives them this right. It should also be noted the constitution allows the government to levy taxes for the common good. Conservatives seem unable to read this clause. The book “Sapiens, a Short History of Humankind” has a good chapter on constitutions and legal systems and puts it in context. These are just beliefs and mental constructs shared by parts of humanity. They are not the same as scientific laws and lack the same objective basis or level of proof. What has the American fascination with guns and the anti-government paranoia of the gun toting right wing zealots to do with Global Warming and the denial of the same? And who will help the Americans when their right wing white supremacist militias one day threaten democracy and the lawful government elected by the people?…..
BTW due to the “love of guns” each year more people die in the USA by shooting than the number of soldiers who died in the entire Vietnam war! The rate of gun death per capita in the USA is 10 times that of Germany….. The American Government is unable to research the statistics and causes of gun violence because the NRA has corrupted the political process there to such a degree that research into gun violence is “Verboten” in the land of the free…. Oh how wonderfully sick the IDIOTS of the American right are conducting their business!!! If one had the luxury to study the genus of “Homo Rightwingus Americanensis” from a safe distance – say from aboard an alien spaceship looking down – one could be simply amused and look at the travesties of these people as a sick game show. But unfortunately, these people (for which really new adjectives are needed) are messing with more than their own rotten backyard. Certainly with regards of climate change. Switzerland has about the same penetration of gun ownership as the USA. NZ has about 1 gun for every four people. NZ and Switzerland do have a lot of guns. However America has much higher homicide rates. I wonder if one reason for higher homicide rates is the “right” to bear arms is interpreted by some people as a right to use arms. The point is when rights become “explicit” this might empower the crazies, psychologically. And once you have explicit “rights” on gun ownership, it becomes very hard to alter or amend the gun ownership laws, because then people are accused of being “anti constitutional”. I don’t oppose gun ownership, and used to own a 22, but I feel America have something to gain by regulating them better. America have developed the constitution to contain excessive government power, but have done such a good job they have sort of neutered any government power. Its out of balance. However the connection between rights to bear arms and climate change is rather tenuous. One only has to listen to Ted Cruz with his crazy, misleading anti climate science rants, which are simply an angry, extreme form of conservatism. Forgive me – but completely off topic but as an serviceman…. Only if you have a gun license. There is no such requirement in the US. The structure of the Swiss militia system stipulates that the soldiers keep their own personal equipment, including all personally assigned weapons, at home (until 2007 this also included ammunition). Compulsory military service concerns all male Swiss citizens, with women serving voluntarily. Males usually receive initial orders at the age of 18 for military conscription eligibility screening. About two-thirds of young Swiss men are found suitable for service, while alternative service exists for those found unsuitable. Annually, approximately 20,000 persons are trained in basic training for a duration from 18 to 21 weeks (increased from 15 weeks, in 2003). The Swiss see the need to maintain such a massive militia because of their continued policy of Neutrality. The early perceived requirement for people to carry arms against the possibility of invasion in the US is now rather far fetched. The main reason for the lack of gun control in the US now is because gun manufacturers don’t want any impediment to selling their wares. Invasion is far fetched? In Europe, meanwhile, the British head of Europol has estimates that up to 5000 ISIS operative are now based in Europe, intent on Jihadist attacks against European citizens. The US and Canada are also importing large numbers of similarly disposed people. The EU is trying to introduce gun control into Switzerland, which it has the ability to do via the Schengen agreement. Norway has stated that it will suspend the Geneva Convention and ignore international law should Sweden collapse, which is looking more likely every week. I am the last one to wish civil wars on the world, and I don’t have a gun or any desire to own one. Thankfully, I live in a peaceful country and intend to keep it that way. You obviously watch far too much faux news andy. it is their job to keep the people afraid – that way they avoid thinking about the real problems – like climate change. Andy, I can’t see how owning guns will stop suicide bombers. Still I suppose it will make people feel better. Trump wants to ban all moslem immigrants. This wont stop determined terrorists either. But it would make sense to at least be very selective with immigrants and do good background checks. America has a lot to answer for. They have basically interfered in the middle east for their own ends, and destabilised the whole place by removing or undermining strong leaders. ISIS and Al Qaeda have been the results. Extreme terrorist groups thrive on power vacuums. However we are still stuck with the current reality to deal with somehow. What a mess. This interview with Eagles of Death Metal frontman Jesse Hughes is rather poignant and heart wrenching. Nothing, I was responding to Nigel about conservatives attitudes to big govt, which he brought up. What has the American fascination with guns and the anti-government paranoia of the gun toting right wing zealots to do with Global Warming and the denial of the same? Nothing, I was responding to Simon who brought up the topic of guns. The latest UAH global satellite temperature data for the atmosphere for February 2016 is now out. This link has a graph for 1979 – February 2016. This is just February but it shows a big and sudden temperature spike higher than 1998. The 2015 el nino is now starting to really show up in this data. It looks likely 2016 will set a record as a whole. The satellite data has shown a slowdown over the last decade, but this now looks over.